But they are made in eastern China and soon could be hit by punitive tariffs of Trump’s own making as he ratchets up a rancorous trade dispute with Beijing. At the Jiahao Flag Co Ltd in Anhui province, women operate sewing machines to hem the edges of “Trump 2020” flags the size of beach towels, while others fold and bundle them for delivery. 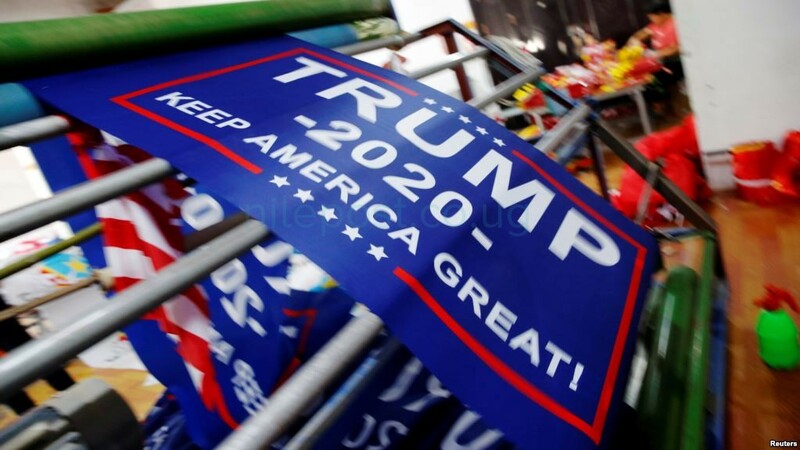 The factory has turned out about 90,000 banners since March, said manager Yao Yuanyuan, an unusually large number for what is normally the low season, and Yao believed the China-U.S. trade war was the reason. The Trump administration has imposed tariffs on $34 billion worth of goods from China. After Beijing retaliated in kind, Washington announced levies on an additional $200 billion worth of products and threatened more, targeting potentially all of China’s exports to America, including flags. At about $1 apiece, the suppliers of the paraphernalia that will surround the Trump campaign can’t resist the low price offered by Yao’s factory. She says the buyers are located in both China and abroad, and she doesn’t know if they are affiliated with Trump’s official campaign or the Republican Party. Her factory has been making Trump banners since the time his tag line as a candidate was “Make America Great Again,” highlighting an irony of his hard-line on trade with China. “Sales have been great ever since 2015,” she said. But Trump’s effort to wrest better trading conditions from China threatens Yao’s price advantage, and his hard-line stance could eventually repel suppliers like Yao. The Jiahao Flag Factory doesn’t only make Trump banners. It churns out American and other national flags and specialty banners, including rainbow gay pride flags. Factory seamstress Sun Lijun is losing no sleep over the trade war, however. “I know that Trump’s tariffs targeting China will have some effect, but we’re not worried at all, since we’re producing foreign flags every single day,” she said.